What if you could have white teeth and a brilliant smile for the rest of your life? What if it didn’t cost you anything extra? While this may sound too good to be true, Green Dental of Alexandria makes it possible. Our “free whitening for life” program has allowed countless patients to retain a bright and confident smile with no additional charge beyond routine dental care. 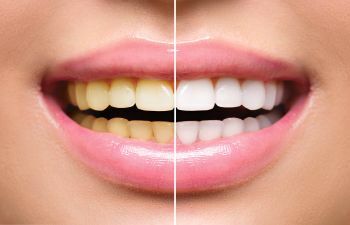 Why is Professional Teeth Whitening So Valued? Teeth whitening is the most popular treatment in cosmetic dentistry. It offers remarkable improvements to your smile while remaining quick and non-invasive. We all suffer from stained or discolored teeth. This can be caused by the dark-colored foods and drinks we consume, a smoking habit or even the natural aging process. Our teeth whitening method relies on advanced in-office technology and a concentrated professional-grade whitening agent. Patients remain in a safe and controlled environment while they comfortably attain a whiter and more brilliant smile. The results are immediate and come with little to no sensitivity or other unwanted side effects. How Do Patients Qualify for Free Whitening for Life? Free professional teeth whitening isn’t offered to just anyone. However, the criteria are easy. To qualify for our free whitening for life program, you must be committed to attending your routine visits in preventative dental care. Two dental cleanings per year (six months apart) is what is recommended for optimal oral health. We believe in this critical step of dental care so much that we are willing to reward patients with a white smile for life. What you are really getting, however, is a smile that is more attractive as well as healthy! For more detailed information about what it takes to get professional whitening at no additional cost, please call Green Dental of Alexandria.